Providing an award winning luxurious transportation with service with a proven track record and reliable service, Limoso Luxury Transport provide the epitome of elegance in Chauffeur-driven transport. Limoso own the largest elite diverse fleet in south-east Queensland, with their 24/7 operations department who monitor each vehicle as they are GPS tracked to ensure every job is executed perfectly. Each vehicle comes unmarked, equipped with complimentary water, Wi-Fi, iPad with your company signage teamed with a trained, professional chauffeur, suited up with a black and gold Versace tie. When it comes to making a reservation with Limoso, you can book by calling their office, emailing the reservation staff or booking directly online with your very own client portal that is personalised for you. They also provide a personalised account manager and event specialist for any special transfers you may have. Luxury fully chauffeured transport to and from Airports around Australia in luxury Sedans, People Movers, Stretch Limousine, Mini Coaches and Coaches. Any time you need luxury transport Limoso can assist. They have something to suit every need from the Corporate Traveller to VIPs with Security Detail, Conference and Gala organisers, Holiday Makers to the Party Goers, and Weddings to Formals. 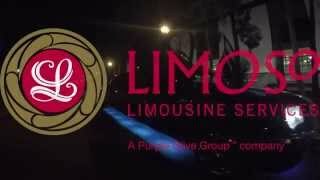 Limoso Luxury Transport can provide luxury transport for your wedding, formal, or special day in South East Queensland. They have a dedicated Special Day Coordinator who is at your service throughout the week, with hassle-free application forms and flexible payment structure remove any unneeded stress from the experience. Also their 24/7 operation means you can talk to a real person if there are some last minute changes. Their level of professionalism, reliability and elegance you won’t find anywhere else. Limoso is a unique combination of modern and traditional, yet sophisticated car hire service ensures that your Special Day is one you won’t soon forget.